Before Christmas as part of the reflective process, I asked the children to consider the differences between the way they played when they were in Junior Infants, and the way they play now, during Aistear time. As they offered comments on the two experiences, I jotted their observations on the board. The chart did not end up being very coherent! We started with a summary of the order of events before and after Aistear. There wasn’t much more to say about the Pre-Aistear Era, and there was so much input for the ‘After’ aspect that it ended up spilling over onto the ‘Before’ half of the page. 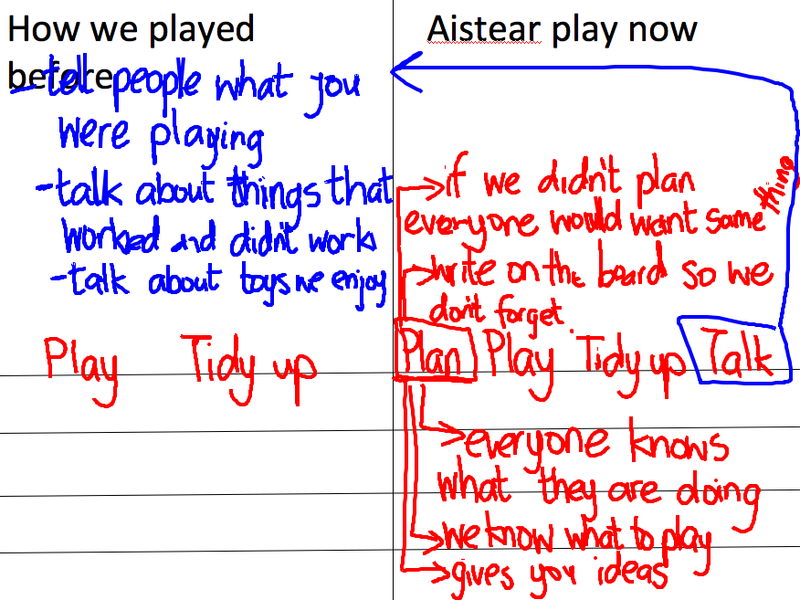 This entry was posted in Planning, Review and tagged Aistear, Children's Work, IWB, Planning, Review. Bookmark the permalink.